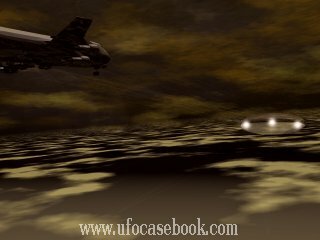 According to a 2004 History Channel documentary, there was an exciting UFO event that occurred in 1996 in the Midwest USA. Air Shuttle 5959: Air Cleveland, this is 5959. We see traffic out there. Ah... twelve to one o'clock. Ah... low altitude. Do you have him on the radar? Cleveland Control: Air Shuttle 5959, that's a negative. Sir, I don't have anything out in front of you at twelve to one o'clock. Cleveland Control: He's down well below you or can you get an estimate on an altitude on him? Air Shuttle 5959: Well, that could be really difficult. Ah... we're between layers here. I'm just going to estimate two-three thousand feet below us. Maybe and ah... sort of ah... pulsating light about, I don't know, ten miles out. Cleveland Control: Ok, Air Shuttle 5959. I'll keep my eyes open. But I don't see anything. Masaba 3179: Yeah, that's where I saw it. A really bright white light, sometimes flickering... ah... underneath the clouds is where I saw it. Cleveland Control: Air Shuttle 5959, is that traffic, ah... that you saw earlier? Do you see him out there any longer? Air Shuttle 5959: Air Shuttle 5959, that's affirmative and it's a light that kind of... it goes dim and it gets bright. I don't know if we're getting closer to it or what? But it looks like a rotating light around it like ah... like a Frisbee type thing that's going around it. Masaba 3179: Ah... sir, I saw it coming out of Detroit and I wondered... ah... all I saw was just a couple really bright flashes of light and it almost looked like lightning and it caught my eye. And then I kept watching it and then it looked a little bit less bright. But it looked like it was underneath the cloud deck to me. And this was just as we were coming out of Detroit. Masaba 3179: The light that I saw was just like, maybe, I don't know... twenty-five miles northwest of Detroit. Is it what you're referring to or you're talking about the light at our twelve o'clock now about ten miles? Cleveland Control: Any kind of target off to your twelve o'clock? Masaba 3179: Ah... we have some kind of white light out there at twelve o'clock and the captain ah... says it's pulsating. It looks like oncoming traffic. But it's just sitting about the same place that it's been the whole... here about ten or fifteen minutes we've been watching it. Air Shuttle 5959: Year, Air Shuttle 5959. It looks like it's almost over Saginaw from our position. Masaba 3179: 3179, that target looks like it's ah... below us. I would guesstimate maybe ten thousand feet. Cleveland Control: Around ten thousand feet, would you think it might be like a reflection? Ah... maybe perhaps off a beacon that for some reason, it's just one of those weird things. Ah... natural phenomena that you're getting a reflection, cause I got nothing out there. Masaba 3179: I don't know. I mean we can see a clear, you know, relatively solid cloud deck... ah... below us and this is definitely ah... distinct whitish ah... well, now it's looking a little red and greenish white, sort of pulsating light and it's constant. It's not a beacon. Air Shuttle 5959: Yeah. Hey, be advised we're descending to four thousand feet right now and as we descend through ten thousand feet, that object is above us right now. It is not on the ground. It's about ten thousand feet. Cleveland Control: Ok, sir. We're checking on it right now. I don't have anything out in front of You at all I'm showing. I appreciate you coming back to the frequency and letting me know. Air Shuttle 5959: I'll keep you advised. I tell you what that is weird. It keeps sitting there pulsating. Masaba 3179: Twelve o'clock sir. Cleveland Control: I'm trying to do a little investigating as to what this might be. If you would keep me advised on this. Masaba 3179: Ok, sir. I'm going to blink my lights at him and see if I can get a reaction. 3179, was the other guy that saw that light was he headed southeast bound or was he headed to (garbled)? Cleveland Control: Well, he was inbound to Saginaw and actually when I sent him over to Saginaw, I expected that was going to be the last I heard from him. He came back up on the frequency and advised me that his clearance was down to four thousand and that he said that what he saw, was still up above him and was like a red... he said it was red and green light that was pulsing and like rotating. He said he would keep me advised and give us a report once he got into Saginaw. You don't have a camera on board, do you? Cleveland Control: Yeah, that would be kind of interesting to have a couple of pictures. I think... ah... might make our case a little better. Masaba 3179: Ok, 3179, we got a passenger taking a picture of it right now and ah... we have a flight attendant who says that ah... they might have saw the same thing the other night. Cleveland Control: Masaba 3179, I copy that. Ah... Masaba 3179, when you flashed your lights, did you get any response? Masaba 3179: Didn't appear to, sir. Cleveland Control: Ok, Masaba 3179, I'm going to send you over to Minneapolis now sir. Is it still on your twelve o'clock? Masaba 3179: Ah... negative sir. It's at about our two o'clock now. We ah... made a turn. Cleveland Control: Ok, so it's off your right side about two o'clock. I'd sure be interested to see those pictures. Can I ah... get you an address that you might be able to send a copy, if you get a copy of them? Masaba 3179: Yeah, sure. We can do that and actually we made a right turn and he's off about ten to eleven o'clock. Cleveland Control: Ok, so he's off your left side. Ok.
Masaba 3179: Ok, thirty-two-nine. We'll see you. I wonder if those pictures will show anything? Masaba 3179: I just want you to know that I took a picture, as captain on the left side. I also took (unrecognizable) of some of the stars above, so the lowest light on those pictures. The only single light at the bottom of the picture should be ah... what you're looking at. And you might be able to get a position with the sky if you want to go that far. Cleveland Control: Ok, great. That's a good idea, I appreciate that.